Hi friends! I hope you're having a great day! I'm doing ok. We still have a residual cough from our cold but other than that, everyone seems ok. B went back to school today and he really seemed to enjoy it. I think he missed his friends. Here's another card I made for Paper Craft Gallery Idol. 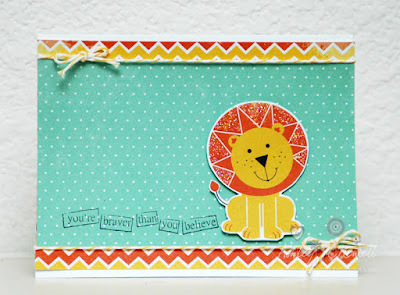 I love this sentiment from Unity Stamp Co. Seriously, who doesn't need to be told that they are brave? I tried to think of a way I wanted to use it. I still might do this in a more grown up card but right now, this just felt right. Cute little lion, huh? I cut it from some Kaisercraft paper that's the same as the other paper on this card. Then I finished with Lemon Divine Twine. Have a great day, friends! Remember, you're braver than you believe! Cute and fun card Ashley. Love it! !